Amazon Parrots is a term that encompasses over 25 different species. Commonly referred to as the Amazons, these parrots are outgoing and intelligent birds that are known collectively to be good talkers. They are medium to large parrots that form strong bonds with their keepers and enjoy the company of their human family members. 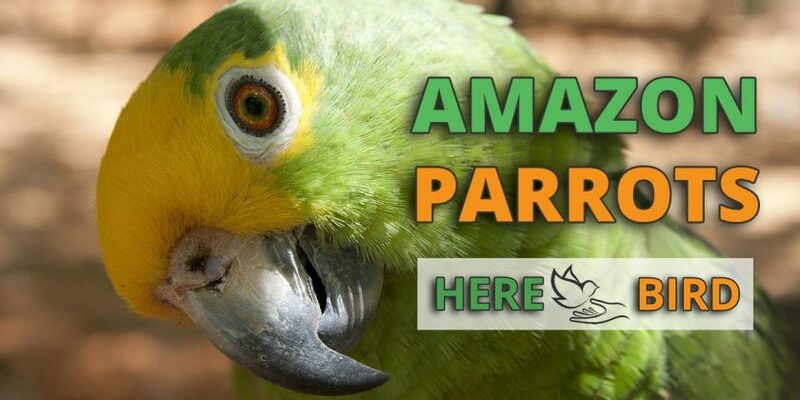 The Amazons are companion parrots and members of the genus Amazona. As their name indicates, their native habitat is in the Amazon region of South America. Some species, such as the Amazona auropalliata or Yellow-naped Amazon are endangered in their native ranges, according to parrots.org. Amazons are generally stocky parrots with primarily green coloration and short, rather rounded tails. Most species need to be DNA tested to determine gender, but the Yellow-lored and White-fronted Amazon do exhibit differences in appearance between males and females. Some of the species of Amazons that are more common in captivity include the Blue-fronted, Yellow-crowned, and Yellow-Named Amazon. They share many characteristics but, as is to be expected, there are differences between the species. We will concentrate on the similarities shared by the Amazons. Their sizes range from the White-fronted at 10 inches (25.4 cm) and 6.5-8.5 ounces (188-242 g) to the Mealy Amazon which measures 15 inches (38.5 cm) and weighs about 25 ounces (708 g). As mentioned, the Amazons are primarily green and have stocky bodies and short, rounded tails. Color variations tend to be incorporated into the bird’s name, as evidenced by the Yellow-naped and the Blue-fronted Amazon, where the blue refers to a patch on the parrot’s head. Amazons have the ability to mimic the sound of their owner’s voice and are considered to be very good talkers. They can also be extremely loud, and can often pose a problem if kept in apartment buildings. Below is a video of a Blue-fronted Amazon talking and singing. What Kind of Personality Can I Expect From an Amazon Parrot? Amazon parrots are very playful and possess a high degree of dexterity with their feet. According to beuatyofbirds.com, having an Amazon is like having a two-year-old child in ability and temperament living with you for 50 years. They are generally calm, peaceful, and social. These parrots tend to only get overly vocal early in the morning or as darkness falls. These parrots can make great pets when they are younger but can pose serious challenges as they reach sexual maturity at around 4 to 5 years of age. In their desire for a mate, your bird may resort to feather plucking or show other signs of distress if they do not receive the attention they crave. In some cases, even your undivided attention will not improve your bird’s emotional state, and the only solution will be to obtain a mate for your parrot. Amazons can become jealous of small children and become aggressive toward them. They can also become aggressive with other pets, especially those smaller than themselves. As with most parrots, they will learn to discipline you with their beaks if you let them, and Amazons are very fond of chewing and can cause damage if left unattended. The Amazon parrot easily adapts to new situations and should acclimate itself to you and its new cage fairly rapidly. These birds are very intelligent and can be trained to speak and perform simple tricks. Gentle repetition reinforced by treats will lead to success as your bird trusts you and accepts guidance and direction. How Should I Care for an Amazon? Amazons come from a variety of habitats and can deal with some variation in temperature, but 65-80°F (18-27°C) is a safe range for their comfort. Minimum cage size is 36Lx30Wx48H inches (91Lx76Wx122H cm) with 3/4 to 1 inch (1.9 to 2.54 cm) bar spacing for a single Amazon. A larger cage is always preferable and for Amazons, this means more places to hang toys to chew on and amuse themselves. Amazons can be prone to obesity so need plenty of exercise which will help them with both mental and physical well-being. Playtime is also a chance for your parrot to interact with you, something it needs for its emotional balance. A healthy diet is also essential and should be built around a diet of high-quality pellets, some seeds, and plenty of fresh fruits and vegetables. It is legal to breed Amazons in some states and generally the birds mate in late Spring with a clutch of 2 to 4 white eggs produced in early summer. There are efforts to reintroduce captive-bred birds into the wild to combat their declining populations. This strategy often fails as the birds cannot fully adjust to life in the wild, according to avianwelfare.org. Amazons species lifespans range from 30 to 60 years in captivity. They can become obese and are susceptible to fatty liver disease. These conditions are controlled by a proper diet and exercise. Egg binding can be a problem with single females and respiratory problems can occur in your pet. 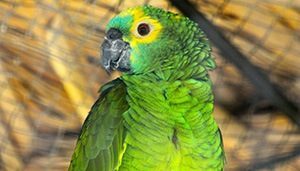 An Amazon parrot will cost you on average around $1500 to buy. Rarer Amazon subspecies can cost up to $3000, whereas on the lower end the most common of these birds will cost $1000. A common species of Amazon Parrot that has a blue marking on it’s head, these birds are known for their singing abilities and sell for $1500 to $2500. Smart and inquisitive and for seasoned bird keepers only, this Amazon parrot has a price in the range of $1000 to $2000. An Amazon Parrot that will bond closely with it’s owner and is a quick learner, you can expect to see them being sold for $500 to $1500. 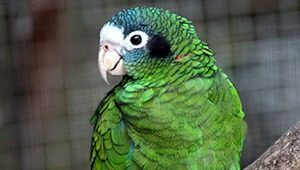 Fairly common as a pet in the Americas, this parrot has a distinctive red, yellow and green colored head and sells for $1000 to $2000. This subspecies of Amazon Parrots is very playful and talkative and so is higly sort after, commanding prices of around $1200 to $2500. Another Amazon that is very popular because of it’s talking abilities and striking yellow head, the bird goes on sale for $1500 to $3000. In addition to buying the bird, you’ll also need a large cage with perches and toys. These birds are serious chewers, so expect to spend some money on replacement toys as well as keeping the parrot well-fed decades long lifespan that it is going to live. Should I Get an Amazon Parrot? These parrots can be challenging to keep and are not recommended for the novice parrot owner.They demand a lot of attention and if not properly trained and socialized, can become aggressive and domineering. Keeping that in mind, they can make a great companion for someone who has the time and patience to make the relationship work.